Dental implants are a fantastic and virtually painless way to replace teeth and regain good function and esthetics. 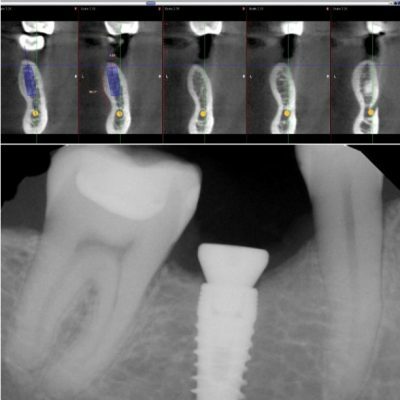 A dental implant is basically a new root which which we can then built things on. We can attach new crowns or even dentures and partials to them. They cannot get tooth decay but do require cleaning and maintenance like real teeth. If you are a candidate (once determined using a consult and special radiography), then the actual placement and restoring of function is usually done in two steps. 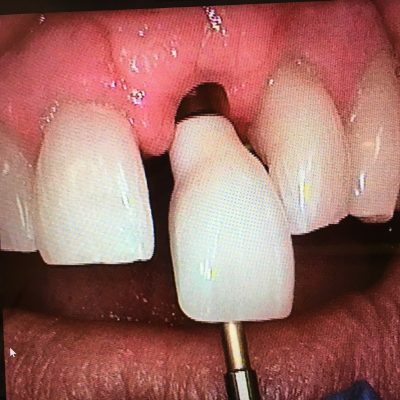 Step 1: Placement – easier than having a tooth removed and virtually no pain by the second day. Most patients will take some medication like Advil but it is short lived. Our team will explain in detail all the steps so you feel comfortable. If your case is complex will also work with local specialists to help get you the care you require. Step 2: Restoration – this can occur anywhere from 4 to 6 months after step 1, depending on the degree of complexity. Now the bone has healed around the new roots so they are ready to be used for function and esthetics. Special parts are attached to the roots depending on the type of restoration you require. Cost also varies depending on this also.